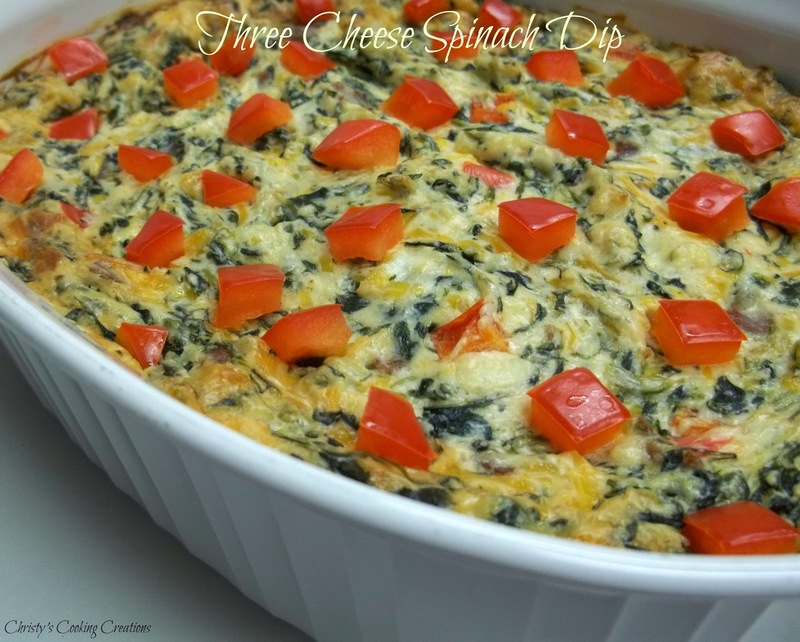 A baked three cheese and spinach dip dotted with diced red peppers . Oh, did I mention it has bacon too? puppy, an itty bitty three week old puppy for Christmas. I think this may have happened because I had begged on several occasions. Bottle feeding, crying in the wee hours of the night, making sure she makes it to the puppy pad in time. Whew! You know that old adage, "Be careful what you wish for, you just might get it." Just kidding, she has kept me busy but is so much fun. I'm pretty sure I would beg all over again...maybe....anywho, on to the first recipe of the new year at CCC. Seems like the holidays flew by this year and in the blink of an eye here I am writing my first post for the new year. With the holidays over, I am in full Super Bowl menu planning mode. My husband and I are huge football fans, the Super Bowl has been declared a national holiday at our house. Just as important as the big game is the food that will be served. This three cheese spinach dip will definitely be joining us on the big day. Cream, cheddar and mozzarella cheeses baked together with spinach, bacon and diced red peppers to melty perfection. Perfect served with crackers, pita bread or my personal fave tortilla chips. You can substitute real bacon bits for the cooked, crumbled bacon if running short on time. I cooked extra bacon at breakfast to have for making this dip. I did have to hide it from the husband and son though, if they had known there would not have been any leftover bacon. The only other thing that requires any amount of time, outside of the mixing and baking time, is the dicing of the red pepper. Do you attend or host a Super Bowl party? What are some of your favorite foods to serve? In stand mixer with paddle attachment beat cream cheese until smooth. Add Worcestershire sauce, garlic powder, cheddar cheese, mozzarella cheese and crumbled bacon; mix until combined. Add spinach and ½ cup of the diced red pepper; mix just until incorporated. Place in one and half quart casserole dish and bake for 30 to 35 minutes. Sprinkle top with remaining quarter cup of diced red pepper. Allow to cool 10 to 15 minutes before serving. Hi Cathy, thank you for stopping by! This sounds awesome! Definitely pinning for later. Found you on Wine'd Down Wednesday. Thanks for sharing! Looks AH-mazing! Yay for yummy things like this! Too bad all the holiday parties are over... Thanks for sharing! Hi Elaine. I would love to share at My 2 Favorite Things, thanks for visiting! Oooh this looks so yummy! Thanks for sharing at Merry Monday! Bacon and cream cheese are two of my favorite things! This sounds like a great way to use them. Thanks for sharing this recipe with Hump Day Happenings! Mine too Jenna! Thanks for hosting Hump Day Happenings! I agree with Jenna--I love anything with cream cheese and bacon! This looks amazing Christy! I found you over on #FoodieFridays and this dip just slapped me right in the face with a great big HELLO! Christie, this dip looks so wonderful! Definitely up my alley! So glad you shared it with us at Foodie Fridays! Pinning and sharing! This sounds like a yummy dip, I can imagine dipping some potato chips into this would be amazing. Thanks for linking up to Sweet and Savoury Sunday, stop by and link up again. Have a great day!! Thank you so much for participating along with us at the #PureBlogLove Link Party! It's always a pleasure seeing your work! It looks outstanding! You had me at bacon! This looks fantastic! Thank you for sharing at #FoodieFridays - I featured this recipe this week. :) Have a great week! YUM !!!!! This looks fantastic!!! Thank you for linking them with us on #foodiefridays!!! They were a hit and one of my weekly features!!! Check it out! This looks great! I would love it if you joined and contribute your awesome posts at my link party at City of Creative Dreams, starts on Fridays at 9AM eastern time :D Hope to see you there at City of Creative Dreams Link Party.